Her chubby fingers fumble with the crayon and her thick eyebrows are slightly furrowed. 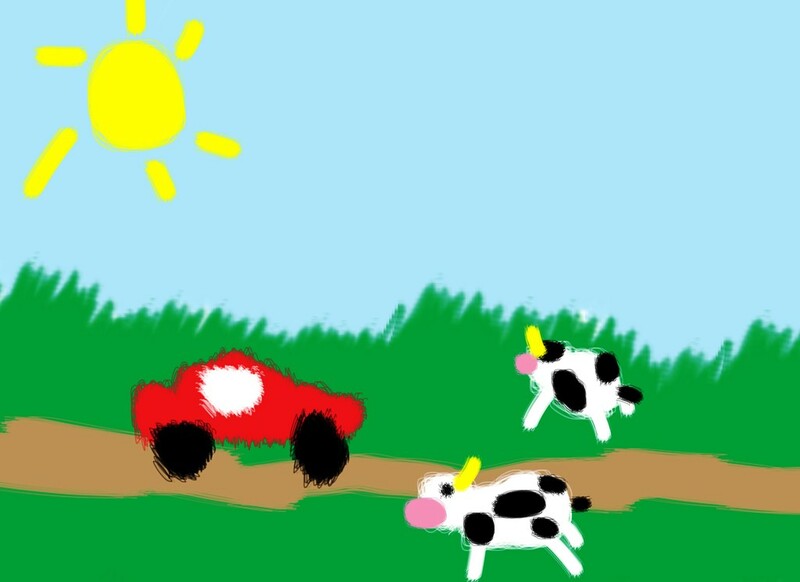 She draws a red car along a road bordered by green grass where two crooked black and white cows graze. Above, there is a smiling yellow sun against a blue cloudless sky. I watch my five-year-old daughter creating a picture and I find myself wondering what her many tomorrows will look like. I close my eyes and quietly affirm a vision. My daughter will be unaffected by differences in race or religion or by competition from peers. She will take differences as a given and peer competition as optional. Her future will be peopled by others who feel the same way, respect the value of choice and embrace the harmony of agreeing to disagree. In her world of tomorrow, petrol-free cars will be the norm, plastic shopping bags will be obsolete, pirated goods will be a bad memory, and consumerism will be utterly boring. Today’s denuded mountainsides will have been replanted with new trees and animals will be undisturbed in their natural habitat or nurtured as cherished pets. At the midpoint of her lifetime, majority of humankind will have learned the complementary truths. One does not need to have everything to live a happy life, and there is more than enough in this world for everyone. People will know that the reason to buy comes from a real need addressed by helpful things to be enjoyed and used for a long time. Mindful spending will translate into a commitment to pay more for products made from environmentally sustainable procedures, fairly compensated workers, rightfully acknowledged innovative ideas, while leaving minimal waste. Business owners will realize that cascading profits to benefit others will flow right back in equal measure, and individuals will discover the unexpected bliss from a simple, uncluttered life. In that clutter-less space, people will hold dear what is truly important–spirituality, relationships, and in ever widening circles, sharing, cascading and giving back to the always generous universe. I feel a nudge as my daughter proudly shows me her completed drawing. Gazing at her open smile and guileless, wise eyes, I see the hopeful promise of her better tomorrow. So true, Corporate Gal. Thanks. There are many parents in the corporate world. Hopefully the decision makers and movers and shakers use their influence toward building that positive vision for all our children. Thank you for your encouraging words and for somehow, sharing the affirmation. The more people there are who share a vision, the sooner the tipping point to manifestation will be reached. Mabuhay! Your thoughts of 15 years ago confirm the universe aligns itself to one’s hopes, dreams and desires. The power of the Word can never be underestimated, especially in all the good we intend for another and for the world. With your positive vision, your daughter (and all of us as well) will benefit. Maraming salamat!